When we think about promoting a healthy bonefish fishery we often turn our attention to protecting large schools of adult fish patrolling the flats. Often forgotten are the more vulnerable juvenile fish, those less than three inches long, that must survive a constant barrage from predators and a chaotic, rapidly changing environment. Nowhere are the challenges faced by juvenile bonefish more evident than in the Florida Keys. Over the years we have seen a decline in the Florida Keys bonefish population, and an usual absence of juveniles. The cause of this decline is still unknown, but it has coincided with changes to freshwater discharge in South Florida, increases in coastal development, and higher frequency of extreme weather events. These disturbances may be responsible for negatively impacting important nursery habitats and at least partially explain the bonefish population decline. Nurseries are potentially the most important and complex habitats that a fish will occupy during its life. They provide protection from predators, abundant sources of food, and environmental conditions that allow for fast growth and an increased chance of survival. And since juvenile bonefish are too small to move to better habitats, taking the nursery habitat away is like pulling a table cloth out from under a castle of cards; the castle will fall. 1) Juvenile bonefish should be most prevalent in the early summer, following the winter through spring spawning season. 2) We recently learned that Bahamian juvenile bonefish use sandy or muddy bottoms with little wave action. Similar habitat in the Florida Keys is rare, and so far our sampling of these types of habitats has captured very few juvenile bonefish. 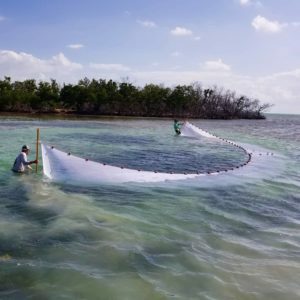 Identifying and protecting essential fish habitat is the first and most important step towards recovering the bonefish population in the Florida Keys. Once we identify bonefish nursery habitats, we can work with county, state, and federal managers to designate these habitats for protection. With a better understanding of the environmental characteristics that make for quality bonefish nurseries, we can work to restore degraded habitats, so they can become functional nurseries again. The future of the bonefish fishery may depend on the success of our habitat conservation efforts.